News is at once good and bad from our southern study area. This is the part of the future Lomami National Park that has the densest concentration of bonobos. 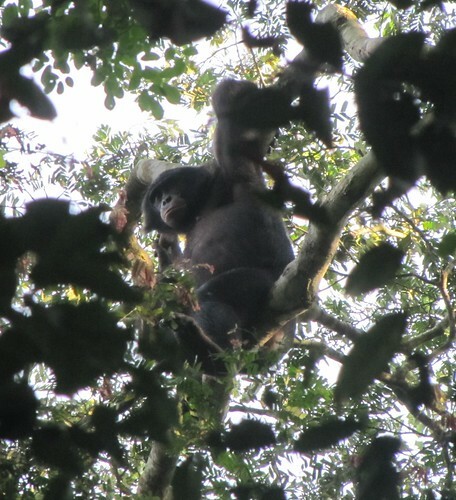 October 2010, a bonobo in the TL2 study area occupied with his own affairs. 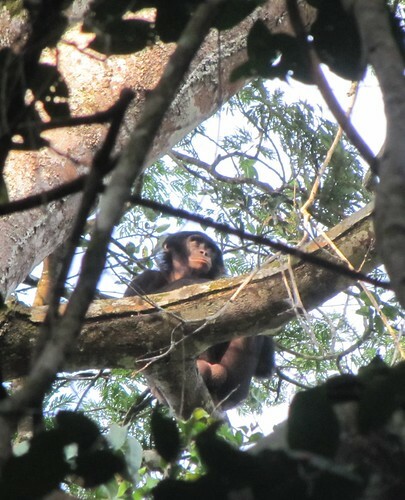 “A new chapter in our relations with TL2 bonobos opened when Louison and his team arrived at the T9 campsite at 4:30 in the afternoon to find bonobos there before them. 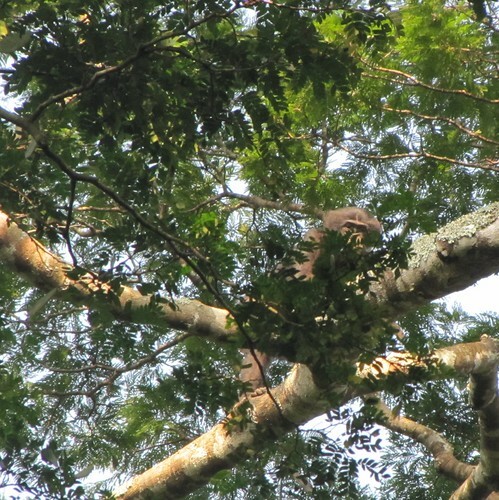 The bonobos were building their nests in trees all around the periphery of camp. When the bonobos did not flee, the team shed their packs and sat in the middle of camp watching the action. By nightfall the bonobos had settled in and the team set up the tents and started their cooking fires. Louison reported lots of vocalizations and some moving around until about 9:30 PM when the animals quieted down. It was clear bonobos and bonobo monitors were going to share the camp site. October 2010, mutual observation in the TL2 study area. A couple such non-fleeing encounters occurred during September and October. These two months were part of the closed hunting season that had been underway in Maniema Province since July. No hunting was reported on or near the study area. September 2010, TL2 study area, more intent on what is in the tree than what is on the ground. Early November 2010. BAD NEWS. 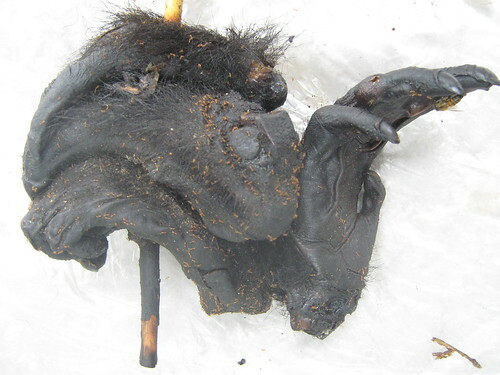 A bonobo killed by hunters on the study area. November 2010, found in hunting camp in TL2 study area, west of the Loidjo River. Hunters avoided the trail system and tried to only set snares where they thought our teams were least likely to go. Some were hunting at night when they thought the teams would have retired to distant camps. They used 12 gauge shot-guns and head lamps. The map Dino had made to show me where the incursions had occured. A double blow was that Wema, a local villager and sometimes porter for field teams, was in the hunting party that killed the bonobo. A year earlier we had paid for his hernia operation and convalescence in the town of Kindu. This just reinforces the obvious: protecting bonobos has to be based on law and law enforcement. Education and diplomacy are important, but not enough. The ADG of ICCN (head of the national parks in DRCongo) had sent guards, but after the closed hunting season they no longer had a mandate to arrest hunters even if they were on our study area. Wema and me, after his operation on the porch of our Kindu apartment. End of November 2010. GOOD NEWS. An important step forward : the southern study area becomes a protected area by provincial decree! 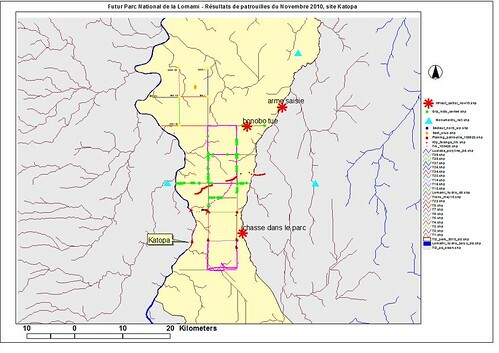 This part of the future National Park, including where the bonobo was killed, is given complete protection by the governor of Maniema and the environmental minister until we can push for national protection for the entire area that is to be protected (three provinces). 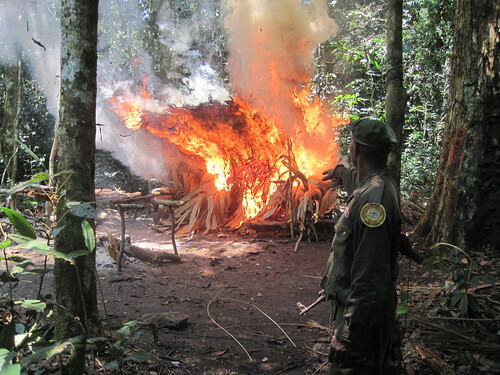 A guard burning a poaching camp in the study area/provincial park. This entry was written by Terese Hart, posted on 2010-12-23 at 6:26 pm, filed under Bonobo, Bushmeat. Bookmark the permalink. Follow any comments here with the RSS feed for this post. Post a comment or leave a trackback: Trackback URL. What exciting developments! Congratulations on these successes … although I am sorry to hear about the poached bonobo and Wema. The bonobo in the first photo seems to have a very pale face, although I suspect it is just the lighting. It seems your team is now in a good position to notice whether or not the bonobos use tools . if they do not, it seems a good bet that lack of tools is a species characteristic.